"The Sexless Innkeeper" was pretty light on story, and had a gaping hole in what little story it had - wouldn't Robin have experienced Lily and Marshall's over-eager desire to double-couple during the brief period when she and Ted were together and Lily and Marshall had gotten back together? - but it was also gloriously silly, and at times very funny. Usually, Marshall and Lily stories deliberately have the two of them operating on different emotional frequencies to create some comic conflict, but because this was about putting them in conflict with Robin and Barney, they both got to be over the top in their emotional neediness, and Jason Segel and Alyson Hannigan played those notes together well. And turning the story into a parody of romantic comedy cliches, complete with the big emotional gesture conducted standing in the rain, was a nice closing touch. And, of course, whenever "HIMYM" mentions a fake website, it has to be real, as things turned out to be with ItWasTheBestNightEver.com, which includes a more elaborate version of the song, featuring guitar by Nuno Bettencourt (in a parody of this Extreme video). Alas, it does not include an expanded version of Marshall's various songs about the cat he killed. As for the titular tale of Ted the nookie-less hotel manager, it didn't take up any more time than was needed, Barney's initial poem was funny, it's nice to see Robin now teaming up with her man to mock her ex, and Neil Patrick Harris did his usual stellar job at playing Barney's visceral reaction to seeing the hot blonde in Ted's room and realizing the path he has chosen in life. Agreed on all fronts, although I never really considered the Ted/Robin connection in terms of the show previously having two couples. I think in that instance Lily and Marshall were still in dating mode, and by living with Ted there wasn't that sense that there was any sort of division between them: here, where hanging out as couples became something more of an event, it seemed more substantial and thus somewhat justified for Robin to see it differently (plus, with Barney involved, they would be that much more intolerant of the cheese platters). The romantic cliches were very funny -- especially the "Bing" egg timer thing -- as was the video montage, although nothing was as funny as a tiny throwaway moment by Neil Patrick Harris in the opening act. Watch again when Robin pretends to shoot herself in the head. What makes it awesome is Barney pretending Robin's brains just got splattered all over his face. I laughed out loud. Great example of how to take a tired joke and make it work with the right touch of physical comedy. Thought the Robin/Ted coupling was an obvious hole too, although I was wondering if maybe Kourtney Kang was justifying it by implying that it's different when you have your own apartment and you're "hosting" couples. Watch again when Robin pretends to shoot herself in the head. What makes it awesome is Barney pretending Robin's brains just got splattered all over his face. Thanks for pointing that out, as I forgot to. What makes it awesome is Barney pretending Robin's brains just got splattered all over his face. Damn, KVV! I've been hitting refresh over and over, waiting for Alan's review, just so I could waltz in and talk about the beauty of that piece of business. Trust you to sneak in while I was out to do the dishes! I replayed that bit about 5 times before I could even go on with the episode. Let's hope that little ending where Barney realizes what he's gotten into starts the ending of his relationship with Robin. They're actually surprising good together, and they're pretty funny too, but my favorite moments of the show are when Barney's trying to lure Ted and/or Marshall into his devious antics, and that just isn't happening now that they're a couple. Tonight was the first time I noticed the laugh track. 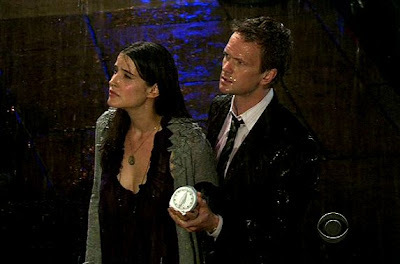 I assume it was always there but man did it stand out in the final minutes of the episode as Barney/Robin get jealous and then stand in the rain. I was wondering if it was part of the parody joke. Okay, my word verification is fackewe. That is awesome. As much as I always resist other peoples' Friends comparisons, the Lily/Marshall plot tonight felt like a Monica/Chandler plot (it would even make sense for Monica, the chef, to only let Chandler be in charge of the cheese). And while I know it's not solely the province of Friends, the "oh, I get it, this particular dynamic is playing out like a relationship dynamic would, right down to people saying lines we associate with relationship scenes" thing is a very Friendsy thing. I just felt like ... we didn't get a whole lot tonight of what makes this show distinctive. Alan - I thought of the hole you mentioned. But at some point someone says that Lily and Marshall have been like that only since they were married. That didn't happen until Robin and Ted broke up. What bothered me more is that this show has done the pairs of couples-as-relationship dynamic before, in season 3's The Platinum Rule. Still, it was silly fun. Innkeeper scenes were great, the rest was lazy. But maybe my feeling this way is a result of my reading an interview with Paul Feig last night, in the book ..And Here's The Kicker, combined with my exceitement for 30 Rock coming back. The Lily/Marshall storyline just seemed so....overdone. And like it was bashing me in the head. There's a lot of head bashing comedy this year; Cogartown was bashing me in the head with sad 40 year old lonely women, and the Middle was bashing me in the head with middle-American normalcy and averageness. Whatever happened to subtlety? And subtlety can occur in outrageousness - 30 Rock, Arrested Development. I dunno.. HIMYM has just felt a bit lazy a lot of the time, for the last couple years, and this ep was another example of that. That bit between KVV mentioned between Barney and Robin in the opening scene was also a favorite moment of mine. Last week so funny, and this week... YUCK. Two not-so-funny ideas (Marshall and Lilly overdo it when entertaining, women are only into Ted because he has a place for them to crash!) spread over 22 LONG minutes. This show felt like it was 3 hours long tonight. Interest has been waning greatly. The captcha sums up the feeling pretty well - it was snestrid. I figured that since Marshall and lilly met each other almost at the same time they met Ted he's been kinda grandfathered out of any double dating couple-y thing. Also they did get somewhat quaded up in Single Stamina. I laughed so hard at the cat-funeral song, I nearly fell out of bed. Which, considering I was already lying down, took effort. I was so scared that one of those girls who came up to Teds apartment would turn out to be one of his students! Best joke: We can't Tabooty call them! Funny. Just funny. Nothing intellectual to add. Lady L! :D Hee. Good times. Love the video montages. The cat funeral especially had me in stitches the whole time. All very well done. And yes, brain splat is awesome. It's nice to see B/R both so committed to the 'gun to my head' bit. That was very them. But, otherwise the ep was a bit weak. I never bought for one second Barney and/or Robin didn't expect that from Lily and Marshall - so I didn't think B/R would have even agreed to do it in the first place - this seemed out of character for both of them not to even suspect anything. Ted and Robin were together for six months before Marshall and Lilly became a couple again. Then when they got back together they were in wedding mode, so having a couple to spend time with was not an issue. Ted should have been privy to their desperation when he was with Stella, but the bigger thing for me was the repeat of the theme from The Platinum rule when Marshall and Lilly were in the position of power (superior position?) in the decoupling. Minor quibble when I get to laugh out loud at Jason Segal singing, and for pete's sake if Barney hurts his feelings he should slap him or at least threaten to slap him, please. I giggled throughout, so it worked for me. The subplot of the sexless innkeeper just felt so...right. It seemed like a conversation i've heard in circles of friends, which is what i love about this show--i feel like it's not just comedy writers writing it, but people who know what it's like to be dating in this day and age. A little exaggerated, but still funny. I still love Robin and Barney, but love the push/pull of Barn to the dark (funny) side of singleness. I'm interested in how they do with that. I thought the video montages were hysterical, and I could see where lily and marshall were coming from, as i think that getting married and moving into their first "real apartment" makes them seem like an old married couple and thus feel the need to do "old married couple things"--namely, dinner parties and GAME NIGHT! And all the awesome pressure that dinner parties can involve! I loved their bickering when it all went wrong as well. I try really hard not to let nitpicks ruin my enjoyment of an episode, but didn't the flashback to Marshall and Lily's first couples' dinner say 2007? That's a glaring error because they were in their current apartment in that scene. Lily's hair was 2007-era, but they didn't move into the apartment into well into 2008. They rarely make those mistakes. Other than that, a decent episode but not on par with the rest of the season for me. I don't think it came together very well. The execution didn't feel as confident as it normally is. That said, there were some good moments -- the poems, the song montages (which made me think of the chart obsession), and Barney's realization at the end -- but it didn't click overall. This seemed to be an off episode. The highlight was the cat song of course and there were some laughs but for some reason (as someone else mentined so I know it wasn't just me), the laugh track seemed very loud and obnoxious. It was distracting. not a real big fan of this one- there were some funny bits but the couples story would've worked much better as a be story. Way too over the top. Anybody know though - was that Barney and Robin singing "all by ourselves"?- couldn't tell. The A-story left me unsatisfied (I feel like this ground has already been well trod in other sitcoms...or maybe even in this one?) But I thought the 'sexless innkeeper' bit was hilarious. Even in the A-story I did think there were some highlights though. I laughed at Marshall's webpages as well as his obsession over his cheese plate. How many slaps are left? Couldn't they give us at least one soon? I think there's at least one to spare, right? I liked the ep quite a bit, and am actually worried about Barney's realization re: the single life. I'm not much of a 'shipper, but I am totally 'shipping Barrobin and want them married by the end of the series. Siiigh. Two slaps left. There were five, and Marshall used one at the end of Slap Bet, one to stop Barney's horrible one-man show ("Moist. Moist. Moist. "), and one on Slapsgiving. Thanks for the column Alan, and thanks to everybody for the comments. I needed to be told what the funny parts to last night's episode were supposed to be. I had no idea while watching. It just reminded me of a time when I was the inkeeper (Ted) compared to the thanksgiving dinner we just hosted (Marshall/Lilly). This should have been a great episode... very little of Ted. But somehow it still missed. Thanks, Alan! Hope we get one of those slaps soon. Especially if Barney does something like leave Robin to go back to being a horndog (although I could see Lily administering that slap before Marshall does, in which case, it wouldn't count!). That is totally NPH and CS singing "All by Ourselves"..it has to be. I recognize his voice, and the female was too mediocre to be a "singer" singer. After all,"Let's Go to the Mall" isn't exactly a vocal masterclass. It had me laughing almost as hard as Marshall's songs. I've never found Alyson Hannigan particularly attractive, but in the first 2007 flashback, her extreme "bosominess" left me mesmerized. I guess that's from her recent pregnancy? Nope, not NPH and Cobie Smulders. It's actually The 88 "All by Ourselves". I found the episode funny, but when I thought about it, I realized I don't really like the way the writers are portraying Barney and Robin's relationship. The whole point of them is that they're not traditional in any sense of the word, so why do they keep putting them in these overdone sitcom situations? There need to be more moments like the two-person suicide imitation, and much less of them going to brunch and Robin complaining about strip clubs. Oh well. I'm just going to keep pretending it's them 'cause it makes me happy. Thanks for the link though! When Robin/Ted was a big thing, Smulders and Radnor played off each other beautifully. Her side of the relationship was equal and brilliant -- I'm thinking stuff like "Moving Day" and "First Time in New York", especially. However, since hooking up with Barney, Robin's been completely overshadowed, and Cobie Smulders is doing her best to make the vanilla stuff she's left with something worthwhile. If she's not an empty girlfriend for Barney with no real character service (as here), she's a completely different character (Double Date). In these opening four episodes, has Robin delivered a single line where you thought 'THAT is a Robin line! And it's funny!'? Even 'Robin 101', which was ostensibly a love letter to Robin, didn't give her nearly enough to do. When there IS distinctive stuff given to them, its mostly about Barney dating for the first time in the ever. Anything great from Robin has been pretty much Smulders, which makes me sad, because Robin Scherbatsky deserves more love from the writers. In fact, this season itself seems to be... off. More brightly-lit and flat sitcommy. There's moments of brilliance (here, specifically "Cat Funeral" and Ted's storyline), but... RoBarn isn't half what it should be, because half of the couple hasn't shown up yet, and the show itself isn't compensating because RoBarn is all over. That said, Josh Radnor and Jason Segel were brilliant in this episode. Radnor playing lusty Ted (a la 'the shirt' in Atlantic City), like drunk Ted, never ceases to amuse me. This is my favourite comedy on TV, and I watch it a few times a week... I just hope the episodes climb back up to S1/S2 level sometime this season. I'd go for Barbin instead of RoBarn, myself - combined names seems to always be first half and last half of the two names. Robarn's the only one that sounds half-decent to me. :D I like saying it. Honestly, I didn't find this episode particularly funny. The only good part was Barney's face at the very end. I hope they play with his reluctance to stay with one woman instead of going out on the prowl. It reminded me of when Sam was about to marry Diane and then he thought about only being with one woman for the rest of his life. As for the Marshall/Lily couple get together storyline: it's an overdone motif in sitcoms: people in non-romantic relationships acting like quarreling lovers. When Robin and Barney were jealous, I just kept thinking, "They would be stoked." Anyway, it's a great show, but that was the first one where I only laughed a little. Ted's storyline was better, I thought, and it should have been the A story. I thought this was one of the worst 30 minutes of TV I've ever watched. It felt like lazy writing, bad over acting and I was bored. I fast-forwarded through the Robin and Barney "All by Myself" bit because I was so uninterested. That song is overused and the use of a song montage seemed like they didn't feel like doing any actual writing to make the story work. Especially when combined with way too many of Marshall's photo montage and cheesy song websites. I get what they were trying to do in this episode, but it failed. Big time.